Yeeee-haaah! Bring It On Home, Kristi! Talk about laying it on--South Dakota's lone U.S. Congressional rep, Republican Kristi Noem, smeared it on with gusto in this morning's Rapid City Journal, telling us in its title that she's "Bringing Home the Farm Bill." Wow. Thanks, Kristi. Could we be more excited? Hardly. In this poster-piece for disingenuousness, Congresswoman Noem says she is "frustrated with the speed of the process but we're making progress." I can think of a lot of words to describe the legislative progress of the farm bill, which should have been finalized and in place two years ago, but "speed" isn't one of them. "Impeded" comes immediately to mind, as it depicts both the glacially-paced movement of the legislation and the lack of political and economic acuity of those who've been holding up the process in the first place. Among the latter group of legislators is our own Congresswoman Noem. She has allied with the extremists comprising the suicide-squad of the Republican party, aka "tea partiers" who are the handmaidens of ultra-conservative non-think tanks like the Club for Slow Growth, the Heritage of the 18th Century Foundation, and The Catotonic Institute. These are the same intellectual whirlwinds who possessed Noem and her political allies to shut down the U.S. government last October and nearly cause its financial collapse by refusing to raise the debt ceiling a few days later. Noem blithely went along with this anarcho-ideological crusade without considering the direct consequences on the economy of her home state, where the tourism industry went instantly moribund with the closure of Mt. Rushmore and other national parks. That ranchers who lost much of their livelihoods during a massive blizzard during that period and had no federal agencies available to assist them must merely have been an oversight for Noem, who professes her concern for passage of a farm bill "that will impact every South Dakotan's life," as she did this morning in the RCJ. That Noem's two-year long commitment to cutting $40 billion out of the Food Stamp component of the farm bill is the main reason the legislation has been stuck in neutral isn't mentioned in her piece this morning. As with Noem's poorly thought out decision to put the U.S. government and South Dakota's economy on hold last October, I wonder if Noem and her advisors understand that the "multiplier effect" of food stamps (resulting in nearly $2 of economic effect for ever $1 spent on food stamps, per Moody's: http://frac.org/initiatives/american-recovery-and-reinvestment-act/snapfood-stamps-provide-real-stimulus/) has a direct effect on an industry "that will impact every South Dakotan's life." Food is what we produce here in South Dakota. The more money that gets spent on food in this country, the more it helps our farmers and ranchers. Get it? Honestly, I doubt that Congresswoman Noem has been able to make that connection, so enamored is she of the right wing propagandists who insist that non-stop across-the-board budget cutting is the rosy path to budgetary and fiscal enlightenment. So, glad as I am that a farm bill seems to be coming together, I really wish that Congresswoman Noem wouldn't pull the wool (probably produced by the sheepgrowers around Newell) over our eyes. This is happening in spite of, not because of, Kristi Noem's efforts. Happily, some signs of sanity are emerging among the Republicans who comprise the majority in the U.S. House of Representatives. A two year budget compromise just happened and it looks like this farm bill is close to being done. We can only hope that by some politically osmotic process it has been dawning on Congresswoman Noem that she's in Washington to represent and fight for the best interests of her constituents, not use them as guinea pigs in right wing economic experiments that have never produced positive outcomes. Yoo-hoooo, Former Governor Rouuunds! Where Aaarrre Youuuu? In yet another installment of some of the best reportage this state has ever seen, independent reporter Bob Mercer this morning details the latest in a series of eyebrow-raising revelations to emerge from the Northern Beef/EB-5 saga. It turns out the legions of guys with the green eyeshades from outside accounting firms that have been called upon to examine the books connected with this fiasco are hampered by the fact that records of many transactions have gone missing. First off, from the "are you kidding me?" department, it turns out that the South Dakota state auditor's office doesn't have a digital records system, so paper records are still kept in boxes--just the way granny used to do. Those records must be kept for 5 years, so all the transactions that took place before 2009 have to be traced using bank data, a cumbersome and time consuming task indeed. Seems odd, though, that South Dakota Attorney General Marty Jackley is quoted in Mercer's piece (soon to be available on the Rapid City Journal website, which still doesn't have it up as I write this) as saying that despite the records gap, his office was able to obtain necessary information involving what he recently described as an "improper transfer" of $550 thousand that occurred in 2011. Jackley said he was able to use "other records." What I don't get and what needs to be clarified is why records of transactions that occurred in 2011, well within the the 5-year window during which they're required to be kept, were missing in the first place. Add that to Jackley's observation that there was an "improper transfer" of state funds, then add those to the as yet publicly undisclosed circumstances of central figure Richard Benda's suicide, and the question of why the Attorney General won't commit the resources of his office to a full-blown investigation into the matter becomes more pertinent than ever. I've already sounded off on Jackley's reluctance to press forward with this, but tiresome as the repetition of it can be, complete explanations haven't been forthcoming. That auditors have to deal with missing records is one thing, that the records which should have been on file were missing in the first place is another. Meantime, some commentary about this matter, all of which was started and much of which occurred during his administration, seems like a reasonable thing to expect from former Governor Michael Rounds. Republican Rounds is still the candidate I support for the United States Senate seat coming up for a vote in November, but that doesn't mean he can expect a pass on all of this. For that matter it's a bit frustrating to see my candidate put on a disappearing act while all sorts of national issues affecting South Dakota are being hashed out in D.C. We haven't gotten a peep out of Rounds as to how he views or would act on them in recent weeks. This is pretty sorry behavior for a candidate whose claim to the stature of leadership is belied by his reluctance to come out and say something about what's going on. More pertinently at the moment, a fiasco that may or may not erupt into a full-blown scandal has Rounds' imprint all over it and cries out for some explanation of how all this could have occurred during his watch in Pierre. I repeat my call from a recent post: come out, come out, where ever you are, Michael Rounds. We're at the point now where people from the administration of former Governor (2003-2011) and current Republican candidate for the U.S. Senate Michael Rounds, if not Mr. Rounds himself, should be answering some questions about the Northern Beef Plant fiasco in Aberdeen. We know that the U.S. Attorney and the FBI are looking into the mangled finances of the venture, paid for as it was by foreign investors who got legal entry into the United States by forking over at least $500 thousand apiece toward the enterprise. That was done under the auspices of the U.S. State Department's EB-5 visa program. The net result so far is the bankruptcy of the $159 million plant, the suicide of one of the state officials who was active in its development from the ground up, and the "improper transfer" (according to South Dakota Attorney General Marty Jackley) of over $500 thousand of South Dakota grant money to that very official after he left the governor's office for private life. Queries from the conventional media and the blogosphere remain unanswered, and new ones keep popping up. The $159 million question right now is, how on earth did the idea for this plant even get off the ground? In an impressively comprehensive post this morning by Cory Heidelberger, who runs The Madville Times (go to http://madvilletimes.com/2013/12/experts-northern-beef-packers-not-viable-failure-part-of-the-plan/ for the full story), the bottom line is that the plant's prospects were dismal from the get-go. At the time, based on my own involvement in the cattle business (I fed and brokered cattle in South Dakota and the rest of the central and northern Plains for a decade from around 1990-2000) I thought the plant would have its trouble because it was intended for slaughtering and processing South Dakota Certified Beef, a program put into place by the Rounds administration that I believed from hands-on experience wouldn't provide enough cattle for the 1500 head/day Northern Beef Plant. In 2006, I even devoted much of a column in the Rapid City Journal (http://rapidcityjournal.com/tsitrian-rounds-needs-more-specifics/article_0cb07eb0-bb1a-59f5-8726-25dad78f8089.html) to the difficulties of finding SDCB at grocery stores, along with the reluctance of producers to go along with the program because of its cumbersome paperwork requirements. A spokeswoman from the South Dakota Stockgrowers Association told me in frustration that nobody from the governor's SDCB office even called them for some advice and involvement. How right I turned out to be, but based on the analyses that are in the Madville Times, the plant's troubles were based on industry-wide issues, not South Dakota-specific ones. Economists and cattle producers themselves had seen that the nationwide reduction of the U.S. beef cattle herd, which is at its lowest since the early 1950s, has put the squeeze on the meatpacking industry for several years now, slowing and shutting down plants throughout the country. I believe the question that Rounds and his people should answer is why on earth they thought a brand new start-up of this size would stand much of a chance bucking that national trend. Surely at some point in the planning phase, somebody involved with the Northern Beef venture and its dependence on millions of dollars in grants and other assistance from the State of South Dakota would have gotten the idea that its chances for success were virtually non-existant. The most compelling question of all is, if they'd known about the high-risk nature of the deal, why did they go ahead with it anyway? Current Governor Dennis Daugaard recently said of the plant that it is still a potentially viable asset to the state and that he hasn't abandoned hope for some success coming out of it. I actually share that view, given that the cattle cycle is likely to turn upward as ranchers gradually rebuild their herds in the face of currently record high prices. But it will take years. Meanwhile the Northern Beef Plant languishes, bought for pennies on the dollar at a bankruptcy auction by a large creditor. What needs to be sorted out now is whether this thing was a self-delusionally driven decision made by a governor whose single-minded commitment to a South Dakota-branded beef industry kept him from dealing with the reality of the business, or just a plain old fashioned ripoff by some people who knew that they could get Rounds to okay just about anything that meshed with his fatally flawed vision. Larry Pressler's In The Senate Seat Hunt? I Guess That's The Distraction Du Jour. Or is that the double-take du jour? Frankly, if it weren't for a railroad crossing at Omaha Street in downtown Rapid City named Pressler Junction, I doubt that most South Dakotans in these West River parts would even recognize the name of the former U.S. Senator, a Republican who served 3 terms, culminating in a 1996 defeat at the hands of Tim Johnson, now retiring from that very seat. Now, after nearly 18 years in the wilderness of self-imposed oblivion (has Pressler spoken out on any issues of consequence to South Dakotans since his departure from public office? ), the former Senator apparently (public announcement forthcoming) seeks to represent this state again in the U.S. Senate, only this time as an Independent. I wish him well, of course, especially as he's got the public support of one of the Rapid Citians I most admire, Don Frankenfeld. Don is no slouch, and the fact that he's behind Pressler's entry into the race gives the whole endeavor a lot more substance and credence than it merits. On this one I think Mr. Frankenfeld is backing a loser who probably won't reach minor contender status. Nothing personal against Pressler, I'm sure he's a great guy and that he must have represented South Dakota with some effectiveness to have won 3 terms in the Senate, but how are we supposed to take his candidacy seriously after two decades of complete detachment from the great political and economic issues of an entire era? The basis of Pressler's campaign seems to be that as an Independent he could tip the balance of power in the United States Senate. In today's Rapid City Journal, Pressler notes that both parties are now controlled by special interests and that he doesn't want to be just another partisan "suit." Okay, but first thing he proposes is restoring congressional earmarks, which are the essence of special interest dominion over Congress. He also wants to reform the tax code, raise taxes on the wealthy and bring our troops home. I'll leave it to his campaign to find out how he proposes to do all that. Meantime, I'm still wondering how and why he kept all that passion bottled up for 18 years, giving us no sense at all of who he is and where he stands on matters that have pre-occuppied his home state and the entire country during that gap in his resume. .This is Johnny-come-lately stuff that seems to serve no purpose other than satisfying Pressler's need to re-enter public life. To me it signals one thing: it's time for Michael Rounds to step out of the shadows and get this race and its attendant policy discussions into the news. Come out, Mr. Rounds, wherever you are. Our Senator Thune's commitment to common sense will soon be tested as a vote on the increase in the federal debt ceiling is about to take place in the Senate. It already comfortably passed the House, where a sizable number of common sense Republicans voted for the increase. Thune told Denise Ross at the Mitchell Daily Republic yesterday (and I thank Cory Heidelberger over at South Dakota's best political blog The Madville Times for calling my attention to it) that he might try to get a commitment favoring construction of the Keystone XL pipeline before voting in favor of the debt ceiling. I think this is political bluff-ola and that Thune will vote for the debt ceiling increase even without a clear commitment from the White House on the pipeline. Why do I think so? Because as a card-carrying member of South Dakota's business community (yep, I'm a fully paid up member of the South Dakota Retailers Association and my local Chamber of Commerce) I believe that most of my peers in this business-clique would be outraged by a replay of last October's economic turbulence caused by Republican stubborness over the budget resolution and debt-ceiling increase. I'm certain that my counterparts around the United States are of the same mindset. Consider that national associations like the U.S. Chamber of Commerce are successfully throwing money and support behind anti-Tea Party candidates (see recent races in Mobile, AL, and northeast LA, which I have no doubt will be templates for races yet to come). As to templates, the benign resolution of the compromise budget talks of a few days ago even got a "yes" vote from South Dakota's Republican U.S. Rep Kristi Noem. She was part of the cabal that shut down the federal government last October, and will probably be the model for of the way South Dakota reps should vote on the debt ceiling talks. That means the ceiling will be raised and we can all go about our business without a replay of the frenzied atmosphere that blew a sizable hole in the U.S. economy last October. I experienced firsthand (via my tourism industry interests) what shutting down Mt. 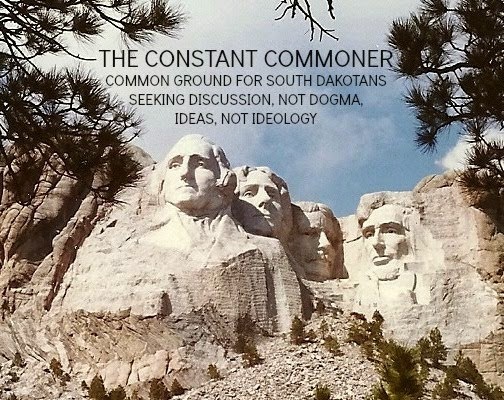 Rushmore did to South Dakota's economy and would rather not experience that again. Senator Thune, I expect you to understand that many of us who supported you over the years will be looking forward to your generally common-sense approach to these things. As Paul Ryan noted a few days ago when announcing the budget compromise, "in a divided government you can't always get what you want." You can try sometimes, but you just might find--you'll get what you need. Anarchy is no substitute for getting the business of government done. How Embarrassing. Check Out Teacher Pay In South Dakota And Compare It To Our Bordering States. Governor Daugaard, Can You Do Something About This? As if being the state with the lowest-paid teachers in the United States isn't embarrassing enough, we South Dakotans should be concerned about how teacher salaries here compare with those of our bordering states. Consider, SD teachers average $39K/year. Now check out the following: In WY, teachers make $58k/yr. In MT it's $50k/yr; in ND it's $47k/yr, in MN it's $56k/yr, in IA it's $51k/yr and in NE it's $48k/yr. You can see this graphically, along with some commentary and analysis at: http://www.washingtonpost.com/blogs/answer-sheet/wp/2013/12/15/how-much-teachers-get-paid-state-by-state/ In general, comparisons that include SD vs. say, NY or CA are pretty much meaningless, given so many economic and location-specific differences. But comparing us to our immediate neighbors is more apple to apple-like . . . and these numbers should be some cause for concern. On the purely economic face of it, we have to assume that top graduates from education departments in the region are avoiding careers in South Dakota out of hand. This is not to denigrate the many outstanding and dedicated young teachers that begin their careers here. I know, at least anecdotally, having been married to a public school teacher for nearly 4 decades now, that many of these fine young professionals are in South Dakota for personal and family reasons. But bright young graduates who have no particular ties to South Dakota are probably ignoring opportunities here, considering they're so financially limited. More tellingly, given the contrasting salaries noted above, those who love the lifestyle of the northern Plains and the Rockies need only go to a nearby state and get the benefits of both the lifestyle and a much handsomer salary for doing the same work as they'd do in South Dakota. This should be worrisome to the forward thinkers who manage our state and its governmental and business affairs. I note the colossal failure of Governor Daugaard's recruitment efforts via headhunting agencies with a national reach and wonder if the Governor's hired recruiters had trouble overcoming the data about our lowest-paid-in-the-country teachers when making their pitches to potential emigres into South Dakota. From a purely public relations standpoint, this kind of information is nasty stuff. I admire Governor Daugaard's efforts aimed at economic development but wonder if he and his staff aren't overlooking, if not altogether ignoring, a major component of the state's infrastructure--the quality of its professional educators--when touting the benefits of life and work in South Dakota. As of now, I think it's a liability, and I challenge Governor Daugaard to commit the remainder of his time in office into converting it to an asset. Anyway, the fiasco is of such magnitude, involving tens of millions of dollars, including grants from the State of South Dakota, that the FBI and the U.S. Attorney are investigating it. That's all well and good, but South Dakota's Attorney General apparently doesn't want to get into the act and has taken to complaining publicly about those who want an investigation. Jackley notes in his press release that in spite of the fact that "the Attorney General has no authority over a federal EB-5 program and the associated approval process of funds, it will continue to cooperate with federal authorities." Given a particular sequence of events that resulted in what Jackley himself called an "improper diversion" (Rapid City Journal 11/23/13) of $550 thousand of South Dakota's grant money that was awarded to NBP, there is an obvious South Dakota-specific component to this whole story--namely, how did more than half-a-million bucks get transferred from South Dakota to NBP to a gent (now deceased via suicide a few weeks ago) named Richard Benda, who happened to be the central operator of the South Dakota office that was working directly with NBP and from which the money originated in the first place? To be a accurate, Benda ended up with $450k, only adding to the mystery by opening the question as to what happened to the remaining $100k. We already know that Benda double-billed the State of South Dakota for travel vouchers to the tune of nearly $6 thousand, so the man is tainted from the get-go. We also know that Jackley won't allow the results of the investigation of Benda's death to go public. We already knew that Jackley washed his hands of any further investigative interest. What we don't know is this: why is Jackely complaining because editorialists and bloggers around the state are harping on him to get the full story. about the details and possible pre-arrangements of a fund transfer that Jackley has already characterized as "improper?" Seems to me the details of any impropriety involving substantial sums of South Dakota's money are worthy of a full-blown investigation by state officials. The classic dodge by public officials on a hot seat is to blame the media for their troubles. Supporters of the officials also often cry "politics!" These dodges are so often used that they would have a place in the "Ad Hominem Hall of Fame" if there were such a place. For my money, the latter is bunk because I support Governor Daugaard in his re-election campaign and his predecessor Mike Rounds in his bid for the Senate. Given the whole NBP fiasco took place during their watches in the Governor's office, I think it's fair to conclude that my interest is in finding out exactly what happened, not politically crippling the two guys I'm supporting in the coming election. As to the former dodge, blaming the messenger--I think Attorney General Jackley better have variations on that theme at the ready, because the media won't be going away anytime soon on this. Man bites dog! Pope renounces Christ! Kristi Noem votes to keep government open! Based on her reasoning for voting for last October's federal government shutdown, South Dakota Congresswoman Kristi Noem's vote in favor of a compromise budget resolution is a triumph of the improbable. Nothing structural has changed, fiscally, in the budget that she rejected along with a pack of Congressional anarchists last October, garnering enough votes to bring the entire federal government to a halt. The same outside, ultra-rightist organizations lobbied as hard as they did the last time to get their handmaidens in Congress to go along with their Tea Party-endorsed slash and burn budget that left no room for compromise. And of course the right wing media kept up its steady barrage of my-way-or-the-highway diatribes. That Noem was able to buck this pressure, along with enough of her fellow Republicans, and vote yes for the compromise budget crafted by negotiators from the House of Representatives and the Senate was a sign that reality may be creeping back into Republican thought processes these days. The compromise budget passed easily in the House and should also clear the Senate. Noem of course took a ferocious amount of home-state criticism after her votes last October. I really don't think it dawned on her that shutting down Mount Rushmore and other national parks during the heart of the Autumn tourist season may not have been the brightest move in the world. On top of that, winter storm Atlas shrugged its mighty shoulders and tore up the state so badly that tens of thousands of cattle and other livestock died in their tracks, perhaps the single biggest economic catastrophe to hit the state since the dust bowl days of the Depression. Financially shell-shocked ranchers, needing some immediate relief, found that the federal offices that could help them out were all shuttered thanks to the shutdown that Noem and the rest of the Republican Party's political suicide squad engineered. Bad move, that, one that is only partly mitigated by Noem's vote for yesterday's compromise bill that should keep another shutdown crisis from occurring, if it does, for a couple of years. I say "partly mitigated" because Noem's next chance at some political redemption comes up soon when the long delayed new Farm Bill finally gets hammered out. This bill, well overdue for renewal by a factor of more than a year, has been stalled because Noem and her fellow Tea Party-stoked Republicans are insisting on stripping away the Food Stamp (technically the Supplemental Nutrition Assistance Program, or SNAP) component of the bill and considering it separately, the general upshot being that Food Stamps can then be used as the next political football over which Congressional forces can fight. Most Democrats and a number of moderate Republicans don't want that to happen, ergo the long-running standoff that has resulted in frustrating delays for ranchers and farmers, in particular, because they have to make planting decisions soon based on how the Farm Bill shakes out. I only hope that Noem, who by yesterday's vote seems to have re-evaluated her basic assumption that national Republican initiatives are not always the best thing for her South Dakota constituents can understand that for every dollar spent on Food Stamps, a buck-seventy's worth of economic activity is generated. In this case that economic activity is directed at the entire food production chain, starting out with farmers and ranchers. Supposedly the new bill will be crafted and voted on in the early weeks of January, and there's no hint of how any compromise, if any, is shaping up. My hope is that Noem will convince us that she's indeed a born-again representative and come up with reasons to devise and support a plan that will do her home state the most good, not one that will gain approving assent by a national cabal of ultra-rightists who will insist on draconian cuts in food stamps. Hey! This Is My Money We're Talking About, Mr. Jackley . . .
. . . and not only is the money mine, but it jointly belongs to about 800,000 other South Dakotans. I wish you'd given that some thought before summarily rejecting reporter Bob Mercer's request to look at the investigation that followed the death of Richard Benda, the South Dakota state official who double-billed the state for travel to the tune of more than $5 thousand and was very involved in the Northern Beef Processors fiasco. You've already identified some improriety in the transfer of $550 thousand of state-granted money from Northern Beef to a private entity. Now you've followed your ill-conceived refusal to further pursue this case with a rejection of public inspection of some of its most relevant documents--those that record the details of the month-long investigation of Benda's death--because one of Benda's family members, a teenage daughter, won't grant written permission via her mother, Benda's estranged (via divorce) wife. This is baloney. Apparently, the feelings of one teenager trump the call for full public disclosure of all the circumstances surrounding Benda's death, coming as it did in the midst of an investigation of his role in the financial wreckage of Northern Beef and its concurrent connections to the EB-5 visa program and a private entity called SDRC, Inc. Sympathetic as I am to the feelings of Benda's daughter, the facts of life for a public official should be clear to all of that official's family--there may come time for public disclosure of many details that are simply uncomfortable or even emotionally unbearable for the immediate family. This is heart-wrenching stuff, indeed, but at this point it seems clear to me that the needs of South Dakota's citizens to get at the truth of what happened to their money have to take precedence over concerns about the pain that will be inflicted on Benda's daughter. Certainly, this wouldn't be the first time that offspring have been emotionally traumatized when the truth about a parent is revealed. Fact is, there's still a reasonable chance that the disclosure of the investigation documents will prove to be benign and not worthy of this brouhaha in the first place. That Jackley and Benda's family are so circumspect about keeping the information close to their vests is what makes that likelihood the object of more than morbid curiosity. Suspicion is reasonably raised, considering both the U.S. Attorney and the FBI are involved in the investigation of the affairs that Benda was so closely connected to. Now that Attorney General Jackley has decided to blow off any further investigations by his office of what he already called the "improper" handling of the people of South Dakota's money ("improperly diverted" to repeat Jackley's exact phrase), his decision to withhold investigative results of Benda's death are starting to look like a trend toward stonewalling. I don't know much about Attorney General Jackley, but I do know this: He's no crusader. At this point we might as well give up on him and his efforts to represent the state's interests and hope that the entire legislature can step in and find out just exactly what happened in this imbroglio that almost daily raises more questions than it answers. Much Ado About Something . . . The Chamberlain School Board is tenaciously committed to doing the wrong thing by refusing to allow a Lakota Indian honor song to be performed at its high school graduation exercises. On a 4 to 2 vote, rejecting a request to perform a traditional musical number in Lakota to honor the school district's Indian students, many of whom are residents of the nearby St. Joseph's Indian School and who make up about a third of the district's enrollment, is a bad move on so many levels that it's hard to know where to start. I guess a place as good as any for my business-minded take on the world is the consideration that each of these students is responsible for bringing thousands of dollars a year into their district, which would be a fraction of its size but for the Indian students. That accounts for a serious economic presence that should automatically give those kids and their families some say about getting recognized come graduation day. Perhaps a less materialistically crass consideration is the divisive effect that this must be having on the Chamberlain community itself. In fairness to the school board it should be noted that the district does much in the way of recognizing its Indian students in the way of activities and learning opportunities, and that a special feathering ceremony takes place the night before graduation--but none of these quite matches the signal moment of a graduation exercise with all its pomp and ceremony--virtually all of it derived from European traditions and their Anglicized variations. Adding a touch of the Indian sense of ceremony and recognition to a graduation whose Indian participants form such a large number of the honorees only makes sense and gives a nod to the fact that times change, and along with the change come changes in traditions and ceremonies. Refusing to accept changes and adapt to them can only create conflicts between those who revere the past and those who are creating the present. On a broader scale, there's also the consideration of how this plays out in the very tough and demanding world of public relations. I can just see how this will play out and reflect on South Dakota if and when the national media get their mitts on it. It's hard for me to see a story that has any sympathy at all for the school board's position. It's easy for me to see plenty of stories that have nothing but derision. I urge the Chamberlain school board to reconsider this decision and let these outstanding young Indian scholars have their moment in the sun come graduation day. Dear Prudence, Won't You Come Out And Play? Prudence, thy name is Governor Dennis Daugaard. As I admire prudence, by extension I admire Governor Daugaard. It was certainly hard to find fault with the Governor's op-ed piece in this morning's Rapid City Journal touting his reasoning for committing much of the unclaimed property windfall that just descended on South Dakota (to the tune of around $70 million) to paying down some of the state's long term debt. Strengthening a balance sheet is always a worthy endeavor, one that every prudent money manager should rank as among the highest of priorities. However, in a state like South Dakota, where scrambling for opportunities is a way of political and economic existence, I'm wondering if Governor Daugaard's single-minded devotion to paying down debt isn't overplaying the prudence hand. Certainly the governor is no slacker when it comes to plunking down some money on growth-oriented ventures like the one he just derailed by pulling out of a $5 million deal with a headhunting agency to find qualified professionals and skilled workers for a state that lately has had a chronic shortage of them. A million bucks into a decision that produced something like 80 jobs, the Governor called the whole thing off the other day, in my view prudently so. Four million of good money after one million of bad called for a bail. Others may have found fault, either at the time or now in retrospect, with Daugaard's decision in the first place, but I was okay with it and would still support it given what we all knew at the time. Nothing ventured, nothing gained. My point is, the economic gains that the State of South Dakota seeks to achieve come with investment, which by definition means some risk-taking. Perhaps it's the failure of the Governor's job-seeking deal that is making him risk-averse just now, perhaps it's the cumulative effect of the Northern Beef fiasco with its ties to the Governor's Office of Economic Development. My take is, paying down debt, even if much of it is to take out obligations incurred by Building South Dakota, this year's variation on the age old theme of economic development initiatives, is probably the least dynamic use of the windfall money that's out there. For one thing, I note that South Dakota's balance sheet is already in pristine condition, with the state's bonds getting very high marks from the various ratings agencies. South Dakota's debt has been managed well and there's every reason to expect our state to maintain its unblemished payment history. For another, I think the State of South Dakota will get a much bigger bang for those bucks if they're put into circulation in any of several categories, including helping school districts with capital outlays, setting up a reserve to make up for shortfalls that might occur if ACA's Medicaid expansion gets a nod from the Governor, giving employers a break on state payroll taxes when it comes to new hires--too many to list here, but the opportunities abound. My hope is that the Governor will at least temper his categorical commitment to paying off bonds with this windfall cash and consider the many productive ways that this money could be put into use by circulating throughout our state. Getting an economist or two on board to help out with the decision wouldn't be a bad idea. A guy who was much wiser and richer than I am once put it quite well: Money is like manure. It doesn't do any good unless you spread it around. So pray tell dear Prudence, aka Governor Daugaard, won't you come out and play? Wait A Minute. We SD Taxpayers are reimbursing our legislators for attending out-of-state meetings where this kind of political boilerplate gets served up? I'm kind of amazed actually. Extremism is one thing. Detachment from reality is another. Here's Republican Senator Ted Cruz of Texas calling for a repeal of the 17the Amendment, taking away direct election of U.S. Senators and returning to the system of having them appointed by state legislatures: http://trailblazersblog.dallasnews.com/2013/12/ted-cruz-at-alec-summit-end-direct-vote-for-senators.html/ He delivered this retrograde broadside today at a "summit" of the American Legislative Executive Council (ALEC) in Washington, D.C., confirming that the need for the restoration of common sense to the Republican Party just got starker than ever. I mean, disenfranchisement anyone? Good grief. That a covey of elected South Dakota state representatives have been attending these gatherings (Cory Heidelberger at The Madville Times did a nicely comprehensive piece about it yesterday--http://madvilletimes.com/2013/12/ten-south-dakota-legislators-attend-alec-events-wick-skips-budget-address-for-alec/) isn't particularly surprising, given the ideological tilt of our state's legislature and ALEC's patently obvious existence as a forum and promoter of extremely conservative political agendas. Besides Cruz, for example, Grover Norquist, who thinks cutting government spending is the only pathway to fiscal nirvana, is a featured performer--make that speaker--at this circle of not-so-smart ALECs. In my view it's the extremist, my-way-or-the-highway approach to governance by Cruz and his following in D.C. that could prove to be the end of the Republican Party, driving so many of the political realists out of the fold that the GOP will be left only with a relative handful of screaming, if powerless, ideological diehards. Those of us in the party who believe that politics is the art of the possible just stand by and shake our heads at these extremists who view politics as the art of self-immolation. But I stray. My main beef in all this isn't that some SD reps choose to attend a political gathering. Heck, they can attend any meetings they want. No, my beef is that they take these ALEC-organized junkets on the state's dime. I'd be just as annoyed if I learned that reps who happen to be Democrats are attending leftist gatherings at the state's expense, and frankly, I'm beginning to suspect that some of them do. Either way, this whole practice of taxpayer-supported trips to political gatherings should come to a halt, and I hope there will be some legislative review of this activity. In the meantime, I'd like each of the relevant elected officials to report back to someone (me, if possible--I can be reached right here at this blog) and explain what occurred at the ALEC meetings that justified spending my money on them. I'll gladly publish the information, and thank them in advance for complying. Governor Dennis Daugaard yesterday during his budget address called for spending $30 million of some unexpected revenues on a newly formed economic development fund called Building South Dakota. This is essentially a pre-payment of BSD's costs to the state, which would have taken years to pay off, including interest. I really think this is a bad idea. For one thing, in this environment of ultra-low interest rates, with long term borrowing still available at very low single-digit rates, I don't think it's a great idea to pay off anything, much less an untested agency that may prove to be of little or no value. That's the businessman inside of me speaking. Looking at it from my taxpayer's perspective, I think there are more pressing needs for the money and that it should be distributed accordingly. Without going into ancient debates, the Governor's draconian cuts in both education and healthcare, made when he first took office under undeniable budgetary duress, have yet to be made whole, even with the respective 3% increases they're slated for next year. As the spouse of a lifelong public school teacher (now nearing retirement and working as a sub), I see firsthand the shortages of teachers and facilities that could stand some serious improvement. For example, oversized kindergarten classes squeezed into tiny bungalows are just not going to make it when it comes to teaching 5-year olds some important skills. Bussing kids from one end of town to the other because of classroom shortages is a terrible use of funds that should go directly into the classrooms. I urge you, Governor Daugaard, to consider some of these pressing needs before you make a final commitment to coughing up $30 million to Building South Dakota. On the healthcare front, getting money to healthcare providers in sums that can take them back to the levels prior to Daugaards sweeping cuts doesn't seem like too much to ask in the way of prioritizing it ahead of an economic development fund. At some point I'll take this up in fuller measure as part of a Medicaid expansion post--but for now I can tell you that medical professionals seem solidly in favor of restoring those cuts, per what I hear and see from associations and individuals. As to the fund itself, why should it get a free pass with full funding upfront when just about every other segment of the state's agencies and dependent institutions has to compete for money at every budget session? Building South Dakota sounds like a good idea, but so did the Governor's Office of Economic Development at one time. The GOED fiasco itself should be fair warning that economic development agencies need careful scrutiny and oversight--and what better way to exercise that sort of control than by making agency directors come forward every year with a score card attached to their request for annual funds? No way can I see handing over a big chunk of cash at the outset and telling those folks to have at it. Make BSD fight for its money like every other agency. So how about it, Governor Daugaard? As a friend and faithful supporter I'm hoping you'll re-consider on the full funding of BSD decision and put that money into circulation where it'll do some good--among the people of South Dakota. Looks to me like South Dakota Democrats are coming up way short as their field for the '14 elections starts to coalesce. Nothing against Joe Lowe (running for Governor), Rick Weiland (running for the U.S. Senate) and Corinna Robinson (running for the U.S. House), but the first question that pops to mind on scanning this line-up is, who are these people? Next question: what sort of qualifications are they bringing to the table? And finally, the most germane question of all: how on earth will they raise the kind of money it will take to mount serious challenges in their respective races? About now I think the best that Dems can hope for is a breakout of scandalous news in the EB-5 investigation that is big enough to taint former Governor Mike Rounds in his bid for the U.S. Senate and sitting Governor Dennis Daugaard in his bid for re-election. There is, of course, one happy note for Dems--they don't have to abandon all hope. Congresswoman Noem is vulnerable just by the fact of being Noem, essentially a tool of outside Republican interests who showed those colors by voting to shut down Mt. Rushmore and other national parks in South Dakota during the peak of last October's tourist season, essentially blowing off her constituents at the behest of a national organization that believed shutting down the federal government was a savvy and productive way of making a political point. However, I doubt that Corinna Robinson will have the political and financial resources necessary to take Noem out, wishful as I am that she could. And speaking of wishfulness, I still haven't abandoned the notion that my neighbor and Harvard University Professor Steve Jarding could enter the House race and give Noem a whipping. Yes, yes, I know I'm a Republican and all that, but uncompromising my-way-or-the-highway Republicans are the bane of the GOP, considering they've abandoned the notion that the responsibility of federal representation calls for governance, not confrontation, practical solutions, not ideological pipe dreams. I've already said I'd back Jarding if he runs against Noem--and for the record, I still like Mike and plan to back Dennis for re-election. Meantime, back to the essential problem facing SD Dems next November. Seems to me it's one of leadership. Too bad for them that Tom Daschle seems to have gone missing in recent years, as he's probably the only stature-laden Democrat that can take the party's statewide reins and pull together an organization that can get excited about itself and possibly coax the Steve Jardings and some other forceful Dems that are now in the wings into running, knowing they've got an energized and committed statewide party structure behind them. The shame of it is that some important debates--I'm thinking Daugaard's refusal to take the Medicaid expansion offer from the Feds, for one--probably won't get aired out as vigorously as they should because the announced Dem field will be consumed with the needs to raise money and build up some name recognition among an electorate that will for most part be wondering just who the heck these candidates are before taking the time and making the effort to pay attention to what's actually being said.